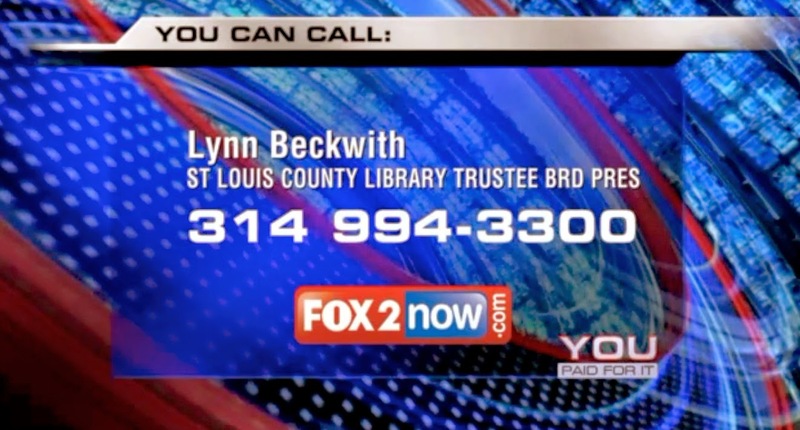 Now is the time we need to exert maximum pressure on the St. Louis County Library's Board of Trustees. Lewis & Clark Branch Library (Photograph copyright © 2012 Andrew Raimist). Meriwether Lewis on library facade (Photograph copyright © 2012 Andrew Raimist). Modern STL is spearheading this preservation effort. Also on hand will be representatives of The North Saint Louis County community surrounding the library, the Society of Architectural Historians, the American Institute of Architects, Landmarks Association of Saint Louis and the Sam Fox School of Design and Visual Arts at Washington University in St. Louis. The news media including television, newspaper, internet-based, bloggers, radio and other broadcasters will be recording and sharing our overwhelming expression of support for this important piece of St. Louis cultural history. 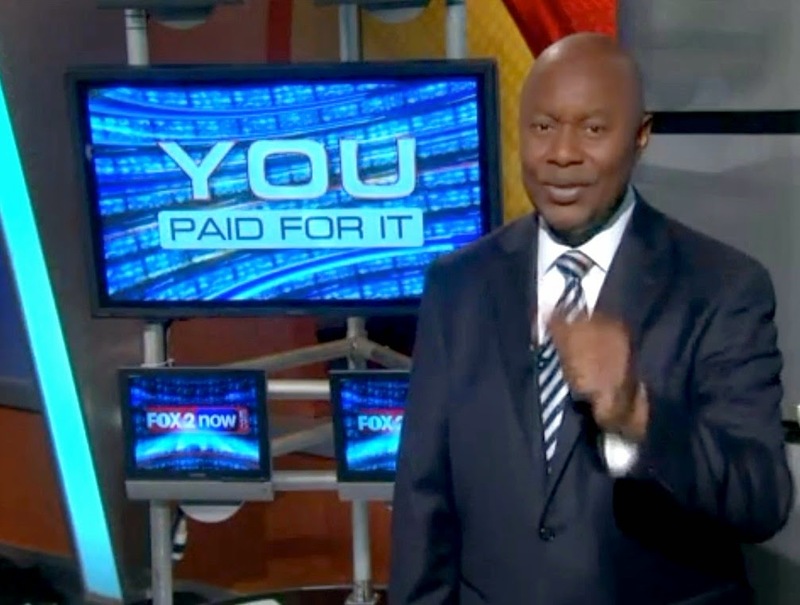 Channel 2 Fox News "You Paid for It" logo. 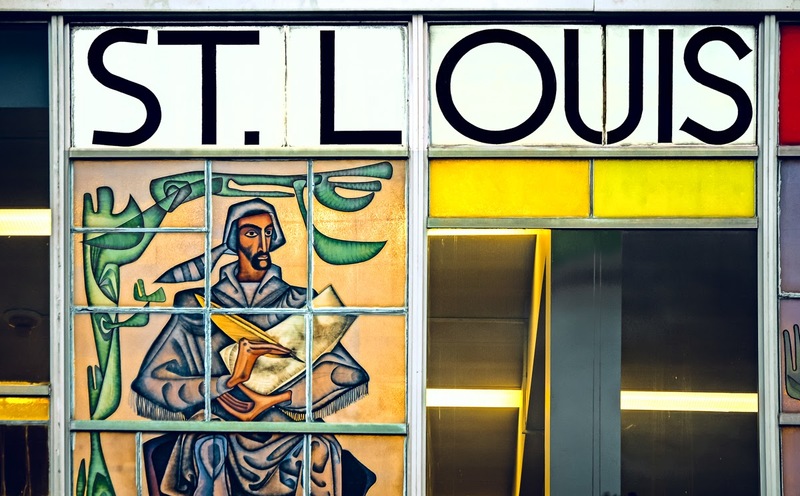 #4 - Share this to do list with friends interested in preserving and enhancing St. Louis architecture culture. Please forward this information to as many of your contacts as possible via email, Facebook, Twitter or your preferred networking tool. Do it now! Children's Corner with Charlie Dooley "READ" poster at lower right. (Photograph copyright © 2012 Andrew Raimist). 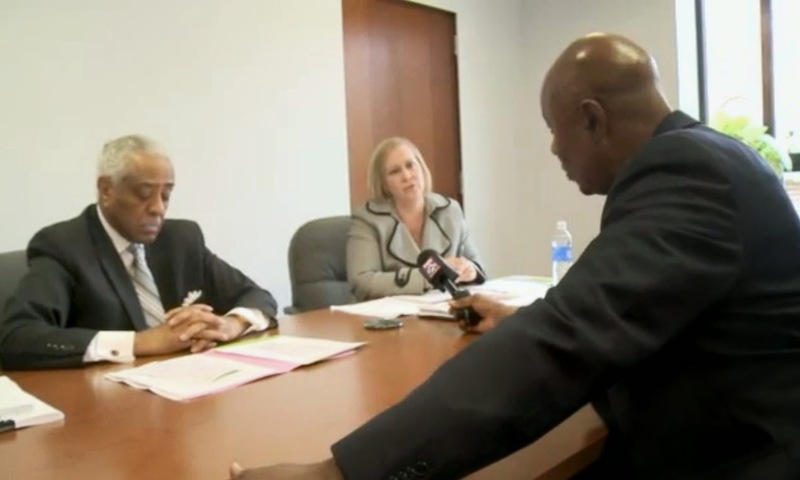 I wrote these comments on a new survey being done by the St. Louis County Library system. Please complete the survey and tell them what you think! "I find the library's plan to demolish and rebuild perfectly functional buildings to be a waste of resources. 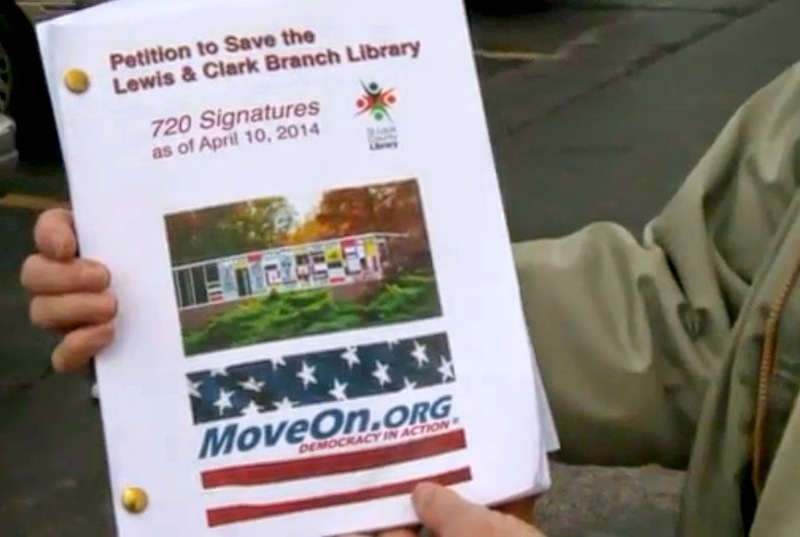 In particular, I am appalled that the library would even consider demolishing the most beautiful, most historic branch in the entire system: the Lewis & Clark Branch Library!! Doing so would be to destroy an important part of our heritage. Please renovate and add an amazing addition! Please use the money saved for special programs to connect to children and adults in the community! Fiber optics to schools. Laptops or iPads for loan. Technology center! Creative work-spaces (music, web design, art, digital media, etc.). 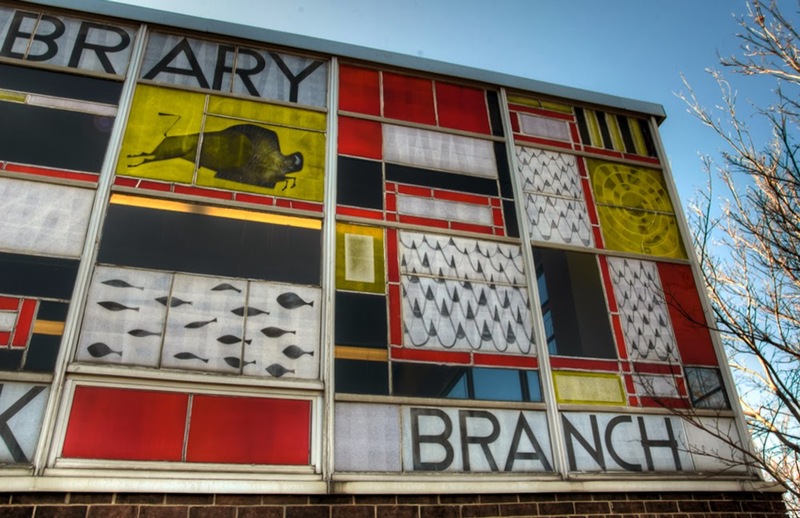 Make this branch the showcase of the entire system to truly demonstrate that north St. Louis County deserves an amazing, state-of-the-art facility that respects and honors its history! There's no reason to waste money on foundations, structure, HVAC, roofing, etc. instead, build on what is already great about the building! Commission new art for the new entrance!" 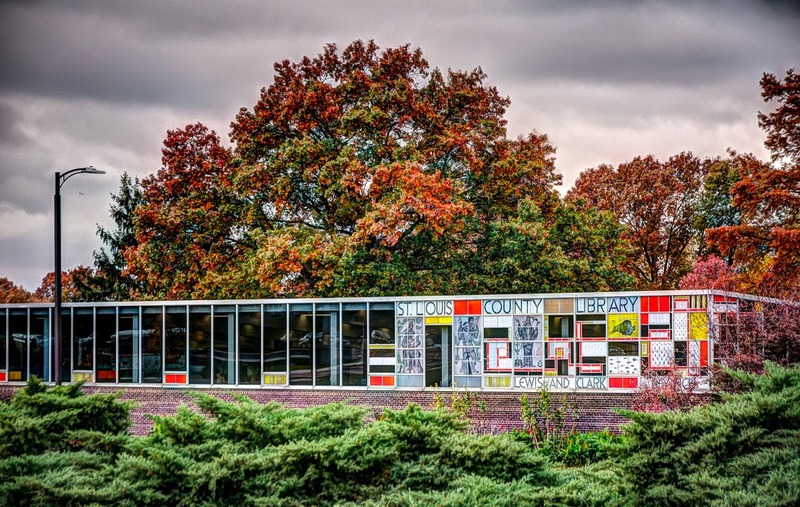 Frederick Dunn's Lewis & Clark Branch Library (Photograph © Andrew Raimist 2013). 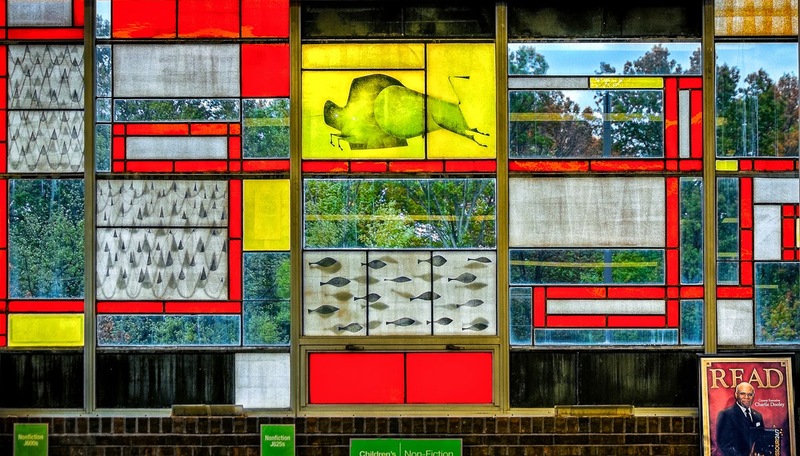 The arguments in favor of demolishing Frederick Dunn's Lewis & Clark Branch Library of 1963 appear to be based either on the building's age ("it must be in need of replacement since it's the oldest branch library") or on aesthetic judgments (i.e., the building does not appear "up to date" and in accordance with what most people would consider a typical image of a library). It's likely some combination of these two arguments are operating in this instance. I will address and dispel each of these ostensible justifications for the building's removal and replacement. Lewis & Clark Branch Library, facade detail (Photograph © Andrew Raimist 2014). The argument for demolishing and replacing the library due to its age is not based on a true consideration of its condition as it stands today. The physical plant is in excellent condition. The building was renovated in 2000 (including new carpeting and repaving parking lot). A new roof was installed in 2004 and new HVAC equipment installed in 2007. Lewis & Clark Branch Library, facade detail (Photograph © Andrew Raimist 2013). Based on the above facts, taken directly from the library's Facilities Master Plan (available online as a PDF, see page 25), the building has no substantive deficiencies from a functional perspective. The only suggestion of a shortcoming is the notion that the library should be 4,000 sf larger than its existing 16,000 sf. Otherwise, no justification for its demolition and replacement is indicated. Demolishing a perfectly functional library appears would be wasteful and irresponsible, constituting an abuse of taxpayers' money. The public would have a "new" library with all of the same features as the existing one, except it will be 4,000 sf larger. This is by no means an adequate justification. Lewis & Clark Branch Library, perspective cut-away view. A fiscal conservative would likely consider this plan to be an example of excessive government funding being poorly used for little or no material gain. In other words: a "bridge to nowhere." Why a 4,000 sf addition to the existing structure has not been proposed is a mystery since the property and building design seem ideally suited for just such an expansion. Replacing the building due to it being functionally obsolete or in need of excessive maintenance is demonstrably false. Let us then consider the arguments based on aesthetics. Dunn's Lewis & Clark Branch Library (Photograph © Andrew Raimist 2013). The apparent confusion regarding the building's function based on its shape and massing is fundamentally an intentional aspect of the building's design. The form of the primary rectilinear box has minimal inflections and in this sense is neutral. 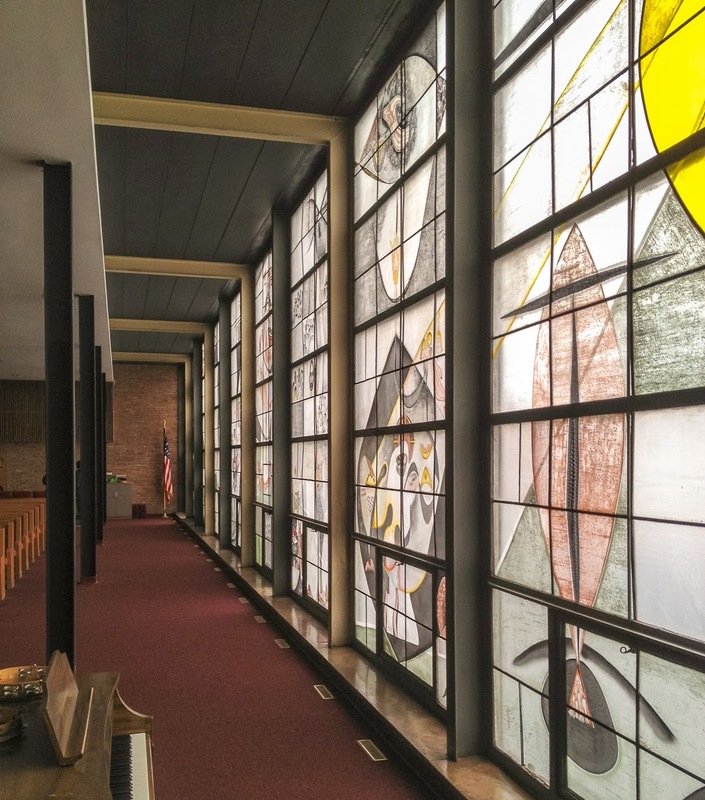 A good example not far from Lewis & Clark is the nearby Faith-Salem Church (7348 West Florissant Avenue, Jennings) designed by Dunn and featuring steel structure and decorative glazing not unlike the Lewis & Clark Branch Library. Another Dunn building in North St. Louis County with a similarly simple, abstract form is his Aloe Warehouse. The Headmaster's House he designed for Country Day School is one of several structures that have already been demolished. His design for the Steinberg Skating Rink is more likely well known by the public; It has similar features: flat roof, monolithic rectangular massing built of masonry and glass. Dunn's Faith-Salem Church, interior, Jennings (Photograph © Andrew Raimist 2013). Dunn's Aloe Warehouse (significantly modified; image courtesy Esley Hamilton). Dunn's Country Day School Headmaster's Home (no longer extant, Post-Dispatch image). 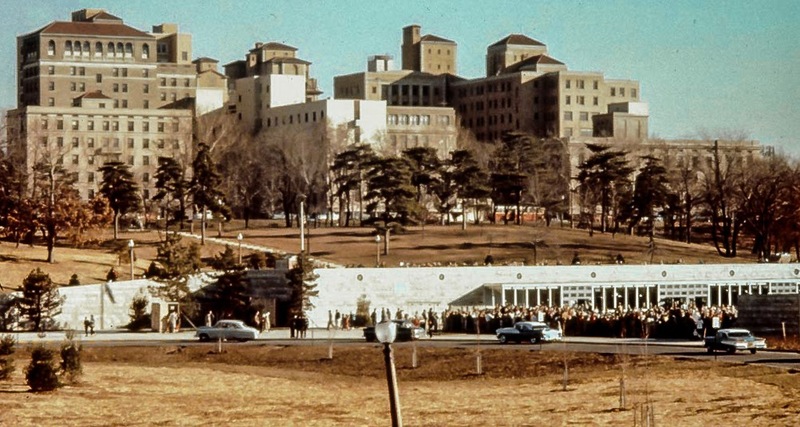 Dunn's Steinberg Memorial Ice Skating Rink, Forest Park, St. Louis (image courtesy Esley Hamilton). This architect preferred simple rectangular shapes for his buildings as did many other architects operating in the modernist mode in the decades following World War II. Each time he was asked to design a church, he invariably began by suggested it have a flat roof. 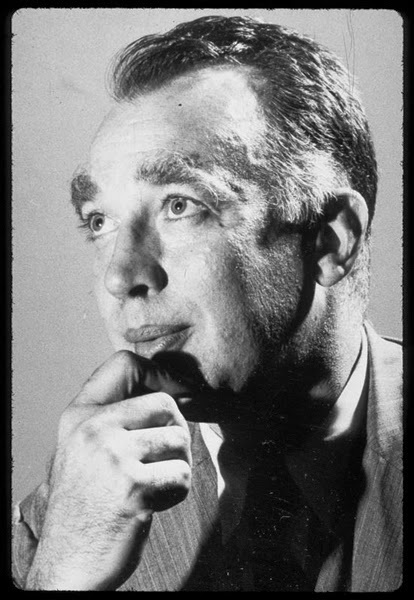 Portrait, Frederick Dunn, Architect (image courtesy Esley Hamilton). Mid-Century Modern architecture for straight lines and clean geometrical forms. This period of design is today seeing a great resurgence of interest, primarily amongst younger adults who identify with the ethos of simple open spaces with extensive daylighting and enclosed honestly and directly without excess, unnecessary complications. 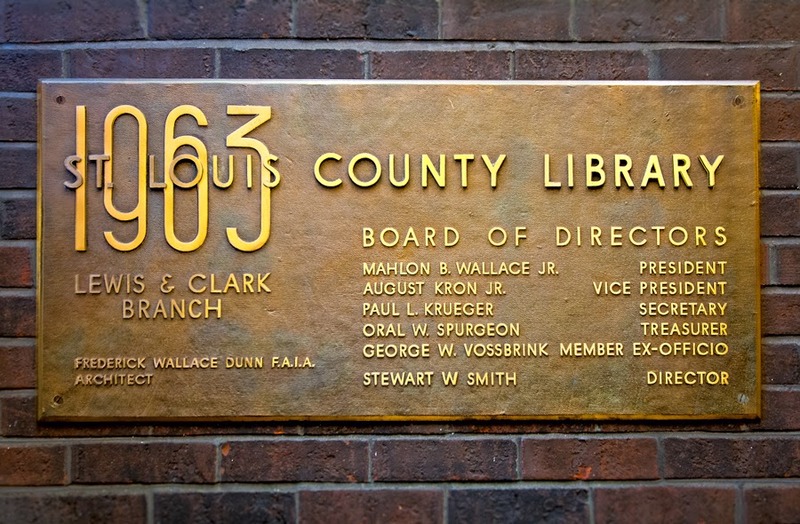 The Library's Board of Trustees is composed of older adults who most likely grew up at a time when buildings of this type were relatively commonplace. It may be they may view the Mid-Century forms and materials negatively from a psychological viewpoint based on a rejection of cookie cutter ranches and rampant suburban development. While this building may not be their stylistic preference, it is an outstanding example of its type. 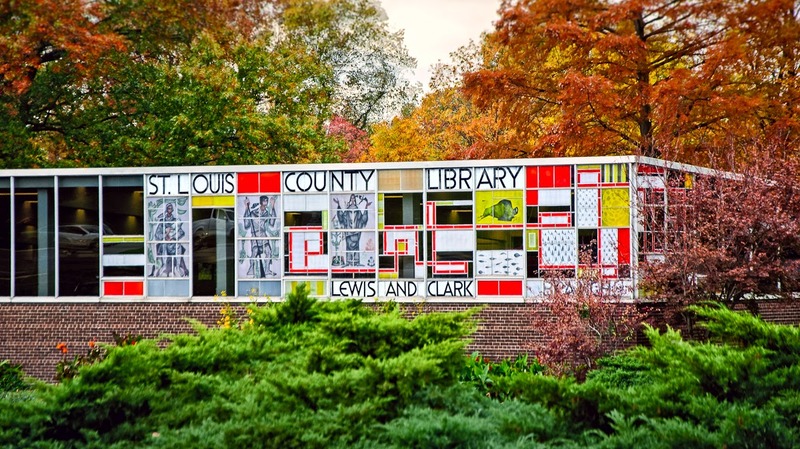 In fact, Lewis & Clark may be the best example of a Mid-Century Modern public building extant in St. Louis County. The appreciation of particular styles of building design often involves the rejection of what is considered to be old and outdated simply due to a building's overall formal references. However, what is viewed negatively by one generation can be considered an important expression of a culture that has largely disappeared, that is, the optimism of Post-War America when economic prosperity and new technologies offered seemingly limitless opportunities for growth. Architecture rejected by one generation is often embraced by a following generation. They understand these buildings fulfill a new critical role in society. They offer a sense of cultural continuity and history evolution through the principles embodied in significant works of architecture. Lewis & Clark Branch Library, detail (Photograph © Andrew Raimist 2013). During the Post-War era, buildings in the Victorian and Second Empire styles were demonized and demolished with abandon. Today, the few examples of these buildings remaining are considered beautiful examples of our cultural heritage to be treasured and preserved. St. Louis nearly demolished it's Old Post Office at that time considering it to be an outdated, ugly pile of stone. Many homes such as those we appreciate around Lafayette Square today were unfortunately lost in the name of progress. 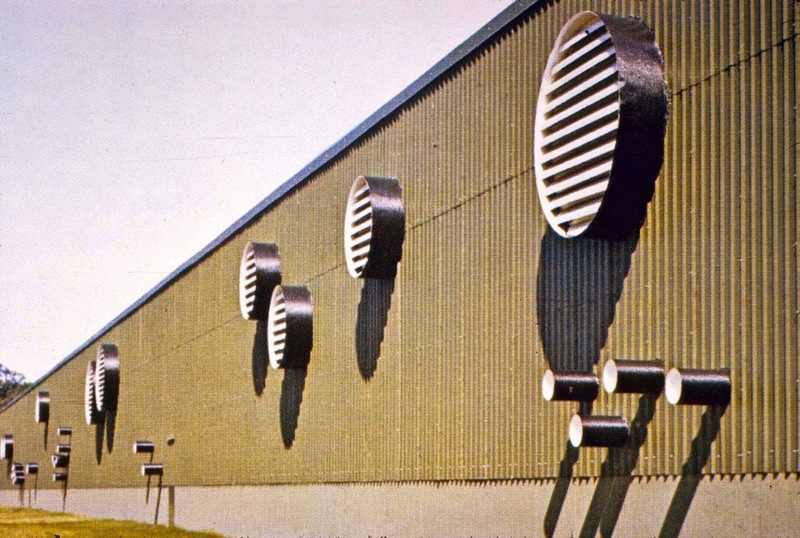 Making aesthetic judgments about a building's quality and value based on personal associations and interpretations can be a dangerous way of dealing with our common cultural legacy. 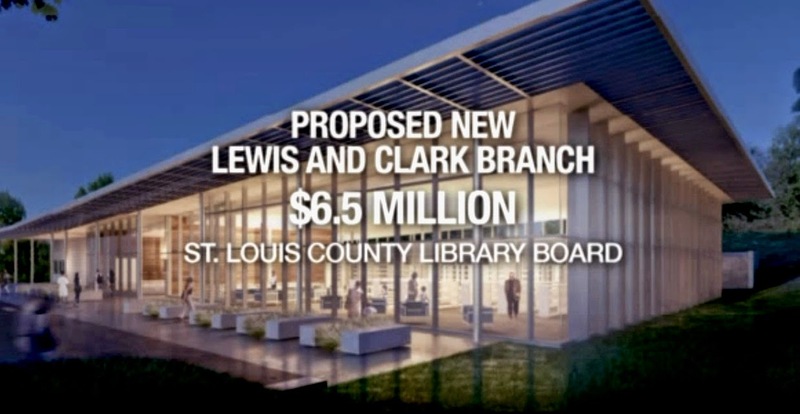 The Lewis & Clark Library was proudly constructed by the citizens of St. Louis County who admired and appreciated its simple, beautiful form. We ought not trample on acknowledged examples of highly regarded structures of any period without adequately considering the irreversible loss. 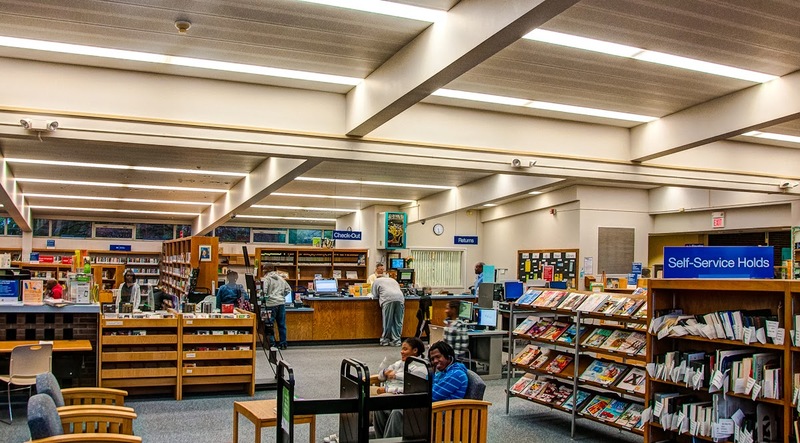 Lewis & Clark Branch Library, interior (Photograph © Andrew Raimist 2013). The essential value of this building is not simply embodied in its decorative glass elements. The experience of the building is a complete, coordinated ensemble. Dismantling and reinstalling those irreplaceable enamel glass windows in a new structure would do them a fundamental injustice. In another essay, I've explained in detail the way in which the design is a complete expression combining form, structure, circulation, graphics, natural lighting, historical references and symbols. In this way it's coherent, meaningful and understandable as the building stands almost perfectly preserved. I'll provide a link to my essay discussing the intentional, interconnected manner in which it was designed including photographs and architectural drawings. My request: the Library's Board of Trustees should put a moratorium on proceeding with demolition and replacement of the existing Lewis & Clark Library while consideration is given to alternative approaches to enlarging and expanding the existing building in lieu of its destruction. Offer the public six months to reconsider this destructive act of cultural vandalism so the community can indicate whether this structure should be retained and celebrated or disrespectfully bulldozed and dumped in a landfill.